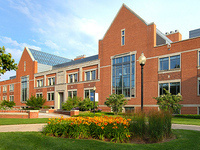 Our faculty and staff are based in Van Zoeren Hall, on the second floor. As an education student, however, most of your courses will include a field experience, getting you out of the Hope classroom and taking on a teacher perspective. Before you’re even officially admitted to the education program you’ll get real-world experience in an actual classroom. There’s no better way to determine if teaching is the career you want to pursue — and no better way to prepare. Our students are in the field for each course and end their time at Hope with one full semester of student teaching before receiving their certification. The following list is where many of our students have taught and been placed. We know how important it is for our teachers to be well-prepared for the technology they’ll encounter in today’s changing classroom landscape. Here’s a list of instruments we offer our students to practice on and work with. The Education Department abide by the International Society for Technology Standards for Teachers (ISTE).